BOGOTA, Colombia (AP) — Former Colombian President Belisario Betancur, whose bold efforts to reach a peace deal with leftist rebels in the 1980s were undone by drug-fueled bloodletting and an explosion of violence backed by state security forces, died on Friday. He was 95. Betancur's death was confirmed by President Ivan Duque, who said on his Twitter account that the ex-president's legacy in Colombian politics, history and culture would be "an example for future generations." 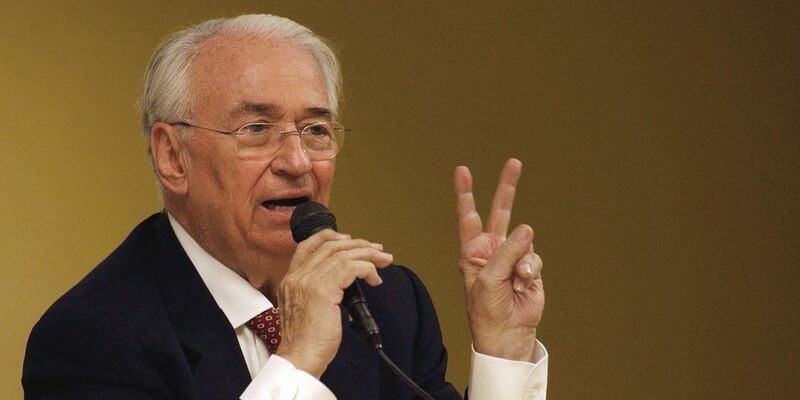 Betancur, who governed from 1982-1986, died in a Bogota clinic after suffering kidney problems. Uniquely in Colombia's elite-dominated political landscape, Betancur wasn't the son of patriarchs but instead rose to the pinnacle of power from a Spartan start as the son of a poor farmer in western Antioquia state. With the aid of scholarships he earned a law degree and throughout his political career held his own as a journalist, economist and poet. His arrival to the presidency in 1982 sparked a wave of enthusiasm that he could deliver Colombians from an armed conflict raging since the 1960s and that would go on to claim more than 250,000 lives and drive millions from their homes. He moved quickly to negotiate a truce with guerrilla groups, defying members of his own conservative party and with an everyman's touch began selling his plan for peace directly to Colombians. But those efforts quickly unraveled as thousands of members of the Patriotic Union — a fledgling political movement tied to the Revolutionary Armed Forces of Colombia — were gunned down by right-wing groups. Later it would be discovered that many of the killings were backed by state security forces. Another rebel movement, the Cuban-inspired M-19, accused Betancur of "treason" for going back on his peace pledges and in 1985 took control of the country's supreme court with the goal of holding a revolutionary trial against the president. The heavy-handed response by Colombia's army didn't wait. What Colombians almost universally refer to as the "holocaust" played out in the capital's main square as a blaze consumed the night sky after troops backed by tanks and bombs stormed the Palace of Justice. More than 100 people were killed, including 11 of the 24 magistrates of the high court, although years later authorities would discover that some of the rebels and suspected civilian sympathizers were taken alive from the building by the army and disappeared. Betancur's actions during the siege were called into question, including his refusal to take a phone call from the court president pleading for negotiations, as well as a government order forcing TV networks to interrupt coverage of the standoff and broadcast a soccer match instead. Barely a week later another disaster would strike: the eruption of the Nevado del Ruiz volcano, which triggered a cascade of mud that buried the entire town of Armero, leaving more than 25,000 people dead. It was the worst natural disaster in Colombia's history and once again Betancur was questioned for not having ordered an evacuation in time. The twin tragedies forever tarnished Betancur's legacy and when he left office in 1986 he largely kept out of public view. For years he maintained that he had lost control of the palace siege to his generals. The former president was absolved of wrongdoing by a congressional investigation at the time. But he broke his silence in 2015, showing remorse for his action as then President Juan Manuel Santos was negotiating with the FARC another peace deal - this time one ending the conflict. "If there were mistakes that I made," he said, "I ask my compatriots for forgiveness."